Lead Head Glass, a Detroit-based terrarium builder, has caught the eye of Martha Stewart as a top American Made craft outfit. Chad Ackley and Derek Smiertka re-purpose window glass from deconstructed homes into terrariums. According to the Lead Head Glass FAQ page, window glass (the kind coming out of homes or businesses) has a different composition than bottle glass, which prevents the two types of glass from being recycled together. Recycling bottles is easy, recycling window glass: not so much. 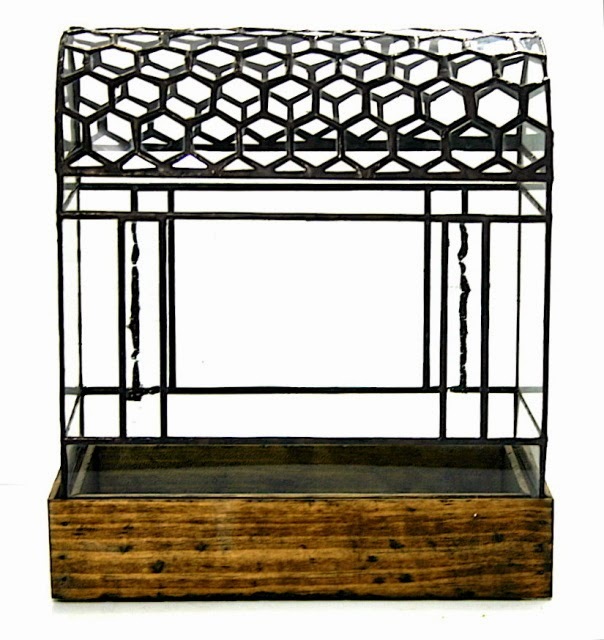 Lead Head Glass designs a mean terrarium, enough to outshine the eco-friendly sourcing of materials. In addition to the stacked box design typical to many paned terrariums, Lead Head Glass terrariums include barrel shaped roofs (Honeycomb House, pictured) and spire-topped gazebos. These stylish pieces were enough to catch the attention of the Martha Stewart Company, as Lead Head Glass is a finalist in this year's Martha Stewart American Made contest, an annual quest to find the best local artisans and entrepreneurs making handmade goods across the country. Winners will be announced on October 17th so snap up a Lead Head Glass terrarium before they blow up! Recycling bottles is easy, recycling window glass: not so much.